Greetings! This is the current State of (my) Freezers. Let me start by saying that the blog has always been about demanding the best from ice cream companies and giving them a nice pat on the back when they come through for us. Sure I could just say I love everything, but, well, I've never been like that. I don't just love ice cream, I care about the experience too. There are just so many treats and flavors that could be better with a little tweaking (and there are some that should just never be made). Anyway, today marks the four and a half year anniversary of the blog. You may say "1/2 year anniversary?" Well, I use to do a quarterly update of how the freezer is looking. I do forget from time to time, but I remembered this time, so let's see how my freezers are holding up. Ok, downstairs is where all the up and coming stuff hides.... sometimes a little too long, like those strawberry TCBY bars. They're actually decent and I have no idea why I can't seem to get around to posting a review of them. There's also cool dogs, an uncle harry ice cream roll, and an ice cream cake, all of which have pretty much been in here all summer long. 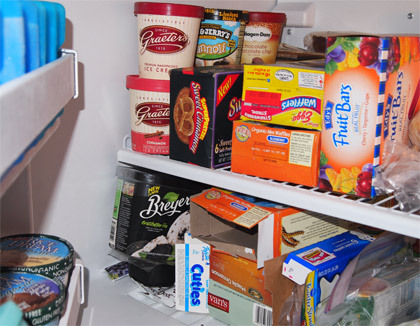 There's some Perry's sherbet, a new weight watchers treat that will be up soon, two more New Orleans ice cream flavors, and another pint of yoplait (ooo, which reminds me, there's a half eaten pint hiding upstairs too). You may also have noticed the un-reviewed simply caramel frozen milky ways that have been waiting about 3 months for a friday night fight. There's even some Klondike low fat ice cream sandwiches which I think have been in there since.... I don't even know anymore. Maybe I need to start keeping a calendar of when I buy things. Ok, so as you can see, there's still a decent backlog of stuff to do. Big thanks to New Orleans Ice Cream Company, Graeter's, Perry's and Haagen-Dazs for all the free samples over the last several months. In a perfect world, I'd love to set up a little facebook app where you guys could vote on what we eat next. That would very cool. Dubs, FYI I bought those cinnamon sugar pretzels and they are quite good! Envious of the stash. I need to get a deep freezer some day...but imagine if the power ever went out?? I bet after the destruction from Irene last year you guys were quite nervous a few weeks ago with Sandy. I was prepared to eat 4 pints of BnJs if my power went out (which luckily it didn't). I was actually already clearing my freezer out to make room for the ice cream source order so all I had during sandy was a pint of b&j's and a bunch of random novelties in mine. The sad thing is Sandy pretty much blew by my area and all we got was some wind. Awesome freezer! 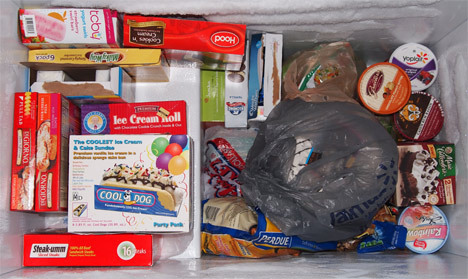 I wish my freezer looked like that :) good ice cream.